Arutz Sheva TV visits the Chassidic New Year Celebration at the Chabad House near Sheinkin Street in Tel Aviv. 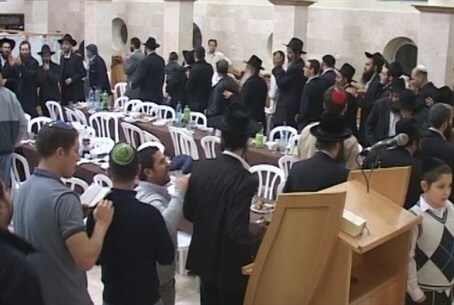 Chabad-Lubavitch Chassidim began celebrating on Wednesday night Yud Tes Kislev, the Chassidic New Year. The date, the 19th day of the Hebrew month of Kislev on the Jewish calendar, is celebrated as the Rosh Hashanah of Chassidim and marks the release from a Czarist Russian prison in 1798 of the founder of the Chabad-Lubavitch Chassidic philosophy, Rabbi Schneur Zalman of Liadi (1745-1812). Arutz Sheva visited the celebration which took place at the Chabad House near Sheinkin Street in Tel Aviv. “We’re marking the redemption and the liberation of the founder of the Chabad movement,” Rabbi Avraham Shmuel Lewin, former secretary of the Agudath HaRabonim (the Union of Orthodox Rabbis of the United States and Canada), told Arutz Sheva. Rabbi Lewin explained that the fact that Chabad House in Tel Aviv is located in an area of the city which is considered secular, does not mean that there is no connection with area residents.